Lightweight steel structures allow column-free, large-scale building rooms and long-span bridges. They can be adapted flexibly to utilisation requirements and are easy to combine with other materials, such as concrete, glass and wood. 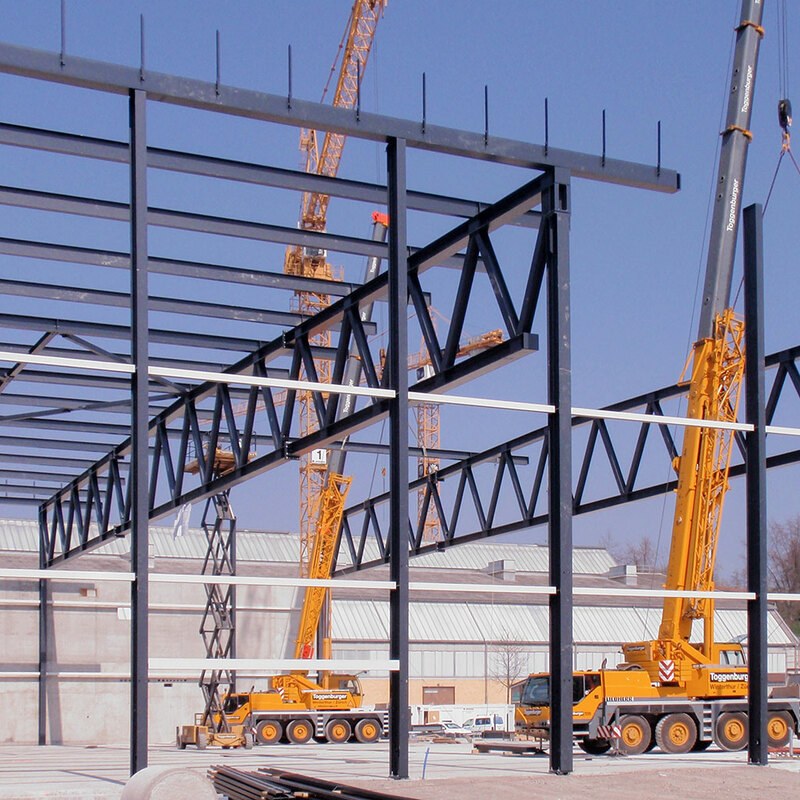 Steel constructions are prefabricated at the factory, enabling short building times. Steel constructions have been one of our core areas since the founding of our firm by Max Walt. Our many years of experience with this material are used when planning, in which we are also mindful of aspects of subsequent upkeep. Whether bridges, large-scale building rooms, multi-storey buildings or long-span special-purpose constructions – wood is almost universally usable, always displaying its positive quali-ties effecting the ambiance of a space. New developments in materials and joining techniques are constantly making further uses possible, with respect to fire protection and high loads, for example. Nevertheless, the material-specific peculiarities that result from its anisotropy and moisture behaviour remain and have to be allowed for in designs. Wood is also ideally suited as a hybrid building material in combination with concrete, steel, glass and plastics. Thus, the properties of the composite product can be optimally improved for one’s respective require-ments. We are actively involved in the development of this diverse building material owing to our close co-operation with research institutions such as the EMPA [Swiss Federal Laboratories for Materials Science and Technology] and the ETH Zurich [Swiss Federal Institute of Technolo-gy in Zurich] as well as our collaboration in the standards commission SIA 265 Holzbau [Swiss Society of Engineers and Architects 265 Wood Construction]. Concrete structures cover a large array of application possibilities – at least being used as a foundation in every example of architecture. As cast stone, with careful planning and execution, concrete makes lasting and durable structures possible. Prefabricated concrete elements enable intricate, high-quality structures that can be constructed in short building times. Thanks to prestressing, long-span, slim and cantilevered load-bearing elements can be realised. 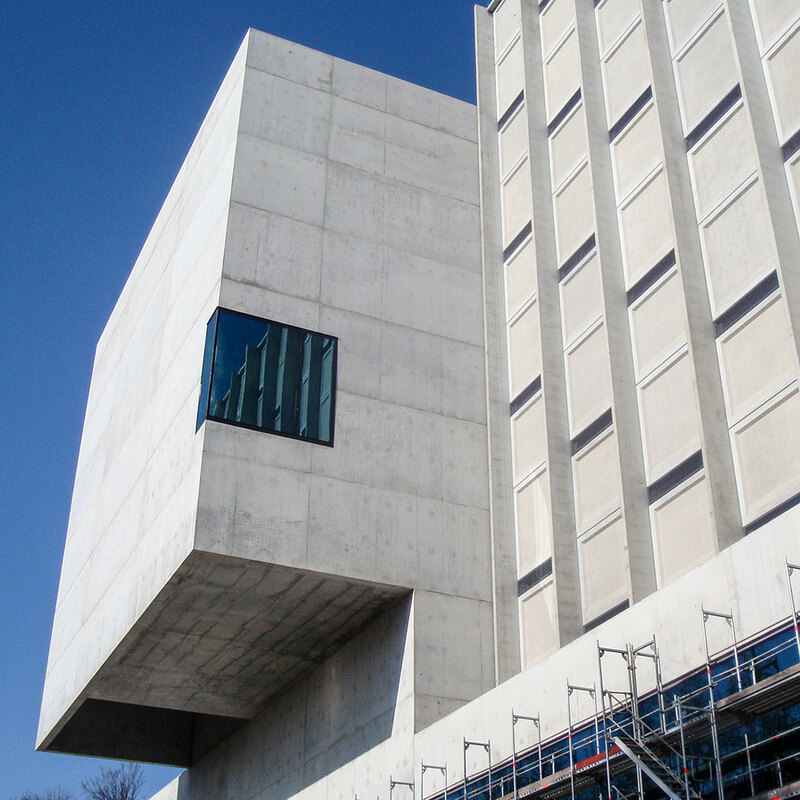 Concrete offers diverse design possibilities as exposed concrete, making it an important architectural element. Conversions are a special challenge for engineers. The framework conditions for each project are different and the possible solutions correspondingly unique. Intensive analysis of calculation methods and construction methods from earlier times makes specific procedures in existing structures possible, allowing existing works to be preserved. We have experience with adding storeys, converting listed buildings, gutting entire buildings, remodelling sport facilities and museums. Strengthening measures reinforce existing supporting structures for changing needs and utilisation requirements. Thus, new findings pertaining to earthquake threats or adding storeys to buildings, for instance, require earthquake safety examinations. Selective earthquake reinforcement measures can adapt buildings to current requirements and extend their lifespans. Older pointsupported flat slabs, such as those used in underground car parks, may have insufficient penetration resistance. Using calculation methods optimised to examine existing supporting structures, we determine the structural safety in place and, where necessary, develop sensible and economically efficient reinforcements. When buildings are designed together with their foundation pits by one firm, interfaces can be avoided and elements of complicated underground construction can be incorporated in the supporting structure. The challenges are many and varied: foundation pits in groundwater, foundations for high loads, upgrading low loadbearing ground, underpinning and shoring existing buildings, deep slope cuts and cut-and-cover construction combining foundation pit shoring and supporting structure. Including fire protection planning early on (clarification of fire-protection requirements) makes finding optimal solutions possible for utilisation, fire protection and the supporting structure. Planning fire protection and supporting structures in an integrated manner allows interfaces to be reduced and synergistic solutions to be worked out. From the initial design to project completion, including special verification of individual building components, such as hotstate design, heat and smoke simulations as well as evacuation verifications, we offer a range of services individually tailored to the needs of our customers. Taking building physics issues into account already at an early planning stage helps ensure the well-being of the user, reduce energy consumption and prevent structural damage. 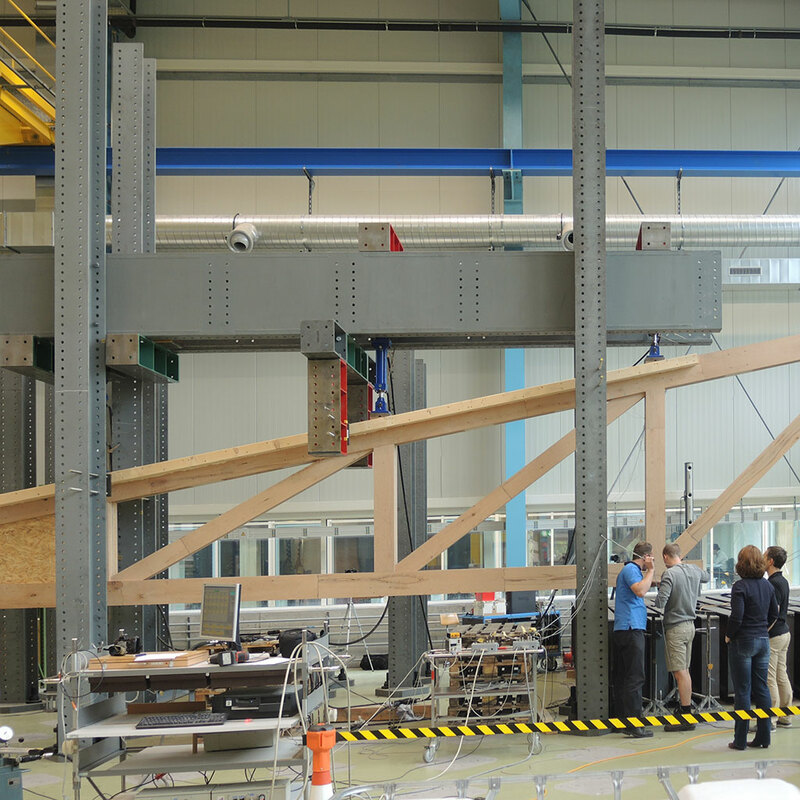 Having one source take aspects of supporting structure and building physics into account in an integrated manner facilitates optimised and economically efficient solutions. Our services cover determining the behaviour and distribution of moisture, ascertaining the temperature distribution in structures, performing energy verifications and sound insulation both within build-ings and to the outside. The envelope is every building’s public face. Their high priority is due not only to aesthetics but also to the fact that they are the component with the greatest influence on a building’s energy efficiency. The possibilities in terms of styling, design and materials technology are almost limitless. With specialists from the fields of structural design, structural engineering calculation, building physics, fire protection and materials technology, we can be an integral seam between the building contractor, architect and building services planners. Already from the earliest conception phase, this can minimise interfaces, risks and often as a result (operation) costs. The City of Zurich encourages a diverse building culture with the “Good Building Award” competition. WaltGalmarini is handling the project together with Wanner+Fankhauser Architekten. WaltGalmarini assists in the reconstruction of the burned down Wangduephodrang Dzong in Bhutan. We are an engineering firm with 40 staff, most of many years’ standing. Our focus on just a few fields of work allows us to give our customers optimum service and to provide a customized team for any projects. We deal with planning and development, project and construction management as well as studies and expertises. Are you convinced that you could contribute a high level of expertise, customer focus and and entrepreneurial spirit to our team as new player? Are you ready and willing to constantly de-velop and improve? We will be happy to review your application irrespective of any vacancies, will treat this with discretion and get back to you in any case.